The library has just acquired this title published by Long Island Sunrise Trail Chapter, National Railway Historical Society, c2009. It provides great insight into the history and evolution of the oldest railway in the United States operating under it's original name and charter. LIRR still uses two words for "railroad", that being the common usage in 1834. 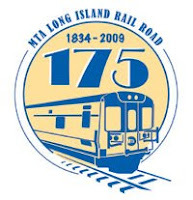 Visit LIRR's website to learn more about th 175th Anniversary Getaway this Saturday, July 25th. As a LIRR passenger hop on board and follow the original route of the LIRR from Penn Station, Jamaica, Mineola or Hicksville to beautiful Greenport Village. Knowledgeable docents will be on board to guide the way. Also check out the exhibit celebrating the centennial of huntington's train station in the train station waiting room.